The Le Touret Memorial is located at the east end of Le Touret Military Cemetery, on the south side of the Bethune-Armentieres main road. 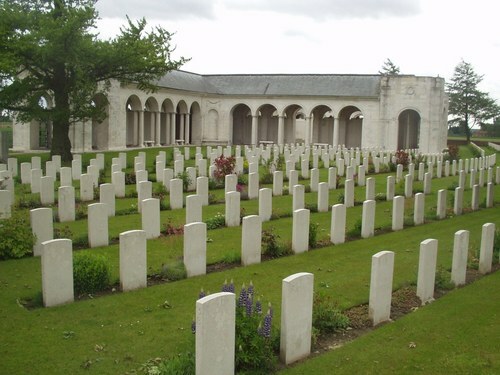 It commemorates over 13,400 British soldiers who were killed in this sector of the Western Front from the beginning of October 1914 to the eve of the Battle of Loos in late September 1915 and who have no known grave. The Memorial takes the form of a loggia surrounding an open rectangular court. The names of those commemorated are listed on panels set into the walls of the court and the gallery, arranged by regiment, rank and alphabetically by surname within the rank. The memorial was designed by John Reginald Truelove, who had served as an officer with the London Regiment during the war, and was unveiled by the British ambassador to France, Lord Tyrrell, on 22 March 1930. Almost all of the men commemorated on the Memorial served with regular or territorial regiments from across the United Kingdom and were killed in actions that took place along a section of the front line that stretched from Estaires in the north to Grenay in the south. This part of the Western Front was the scene of some of the heaviest fighting of the first year of the war, including the battles of La Bassée (10 October – 2 November 1914), Neuve Chapelle (10 – 12 March 1915), Aubers Ridge (9 – 10 May 1915), and Festubert (15 – 25 May 1915) and Givenchy (15th June 1915).